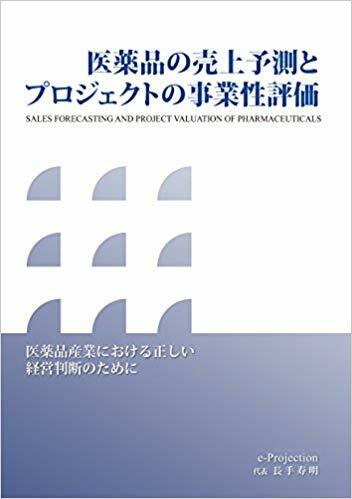 Tosh Nagate’s writing describes the methodologies of sales forecasting and valuation of pharmaceuticals in great detail, as well as the application of these methodologies through case studies. This is the one and only textbook in Japanese of its kind and will be useful not only for analysts and marketers who are engaged in the practice day to day, but also for decision makers in multinational companies, biotecs, academia, and the public sector involved in healthcare. The author brings decades of experience as a forecaster in the pharmaceutical industry and relays the essential skills required to be a great practitioner and subject matter expert. This is a must read for navigating the complex world of pharmaceutical values. Click here for Amazon page. Hepatitis C is a serious burden to the Japanese society, and the treatment of the disease represents a crucial issue. Recent advances in technology have made highly effective drugs with fewer side effects available to the patients. The development and the commercialization of direct antiviral agents (DAAs) have become a hallmark to the hepatitis C virus (HCV) treatment paradigm. These drugs have achieved a sustained virological response (SVR) rate as high as almost 100% in clinical trials, meaning virtually eliminating the virus from most of the patients. Driven by the performance of these drugs, the market for antiviral agents in Japan has almost reached five billion dollars in 2015, representing an astonishing growth rate of 125% per year. To predict the dynamics of the HCV DAA market, we have employed a simple stochastic process model to project the patient population from 2016 to 2025. In this model, we included multiple scenarios based on various assumptions about patient behavior, pricing, reimbursement, and market access. 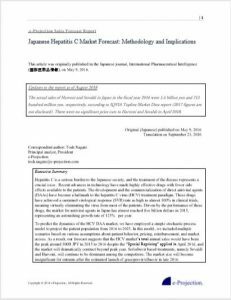 As a result, our forecast suggests that the HCV market’s total annual sales would have been the peak around 300B JPY in 2015 to 2016 despite the “Special Repricing” applied in April 2016, and the market will dramatically contract beyond peak year. Sofosbuvir based treatments, namely Sovaldi and Harvoni, will continue to be dominant among the competitors. The market size will become insignificant for entrants after the estimated launch of grazoprevir/elbasvir in late 2016.